Bama and I are at the table with his affectionate mom, Auntie Dhani, in the open-air dining room of his parents’ house. For the third consecutive year, I’ve joined Bama on his annual trip home for Lebaran, the week-long holiday marking the end of Ramadan. I’d considered flying back to Hong Kong to visit my own family, but by the time I looked up the flights, ticket prices had already gone through the roof. 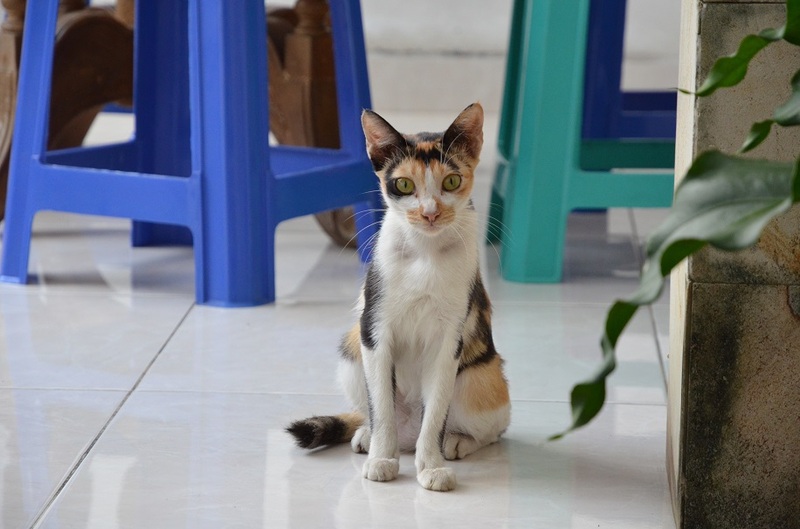 Semarang, a city of less than two million perched midway along the northern coast of Java, was an obvious alternative – not least because of Auntie Dhani’s home cooking and the warm welcome I would receive as an adopted member of the family. Not much has changed in the year since I last came to this lovely courtyard house. 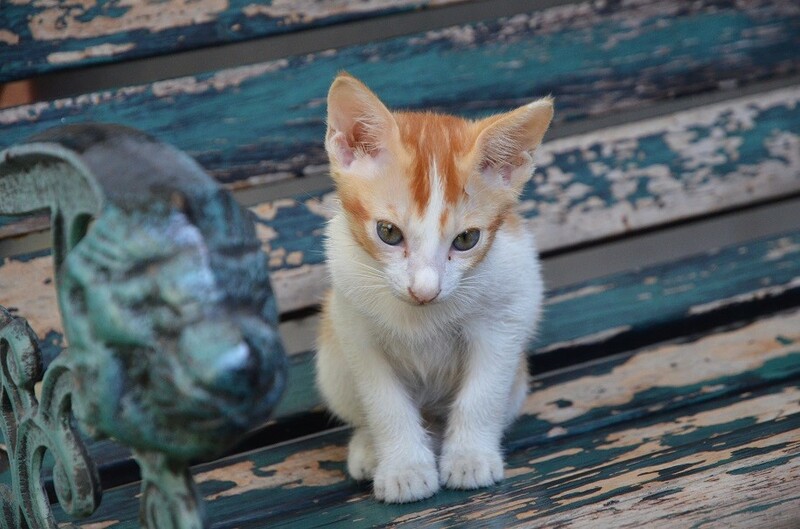 Perhaps the patches of white plaster flaking off the walls have gotten bigger and more noticeable; the potted orchid in the garden is in full bloom; and the household’s newest additions are Miskol the calico cat and her equally shy kitten, who hasn’t yet been given a name. Inside the kitchen, I hover over the hob to take a whiff of the quintessential Javanese chicken curry, opor ayam, bubbling away. Auntie Dhani’s rendition is hands down my favorite Indonesian dish, and has never come close to losing its crown throughout my time in Jakarta. Opor is the centerpiece in a hearty breakfast spread for Idul Fitri (Eid al-Fitr), the first day of the new month, alongside slow-cooked duck eggs; a spicy mélange of diced potatoes, chicken liver, and dried beef skin; and ketupat – fluffy parcels of rice cooked in a diamond-shaped lattice of palm leaves, this time boiled by Auntie Dhani herself. On the second day of Eid, we endure a six-and-a-half hour journey via gridlocked country roads to attend a family reunion. I can’t fathom the tiredness and frustration Bama must be feeling in the driver’s seat, having to constantly stop-start this car with manual transmission. If any visitor needs evidence of Indonesia’s overpopulation, this is it: the island of Java has a mind-boggling 150 million people crammed into an area roughly the size of Greece (or slightly smaller than North Carolina, whose residents number just 10.2 million). Efforts to improve the creaking infrastructure have not kept pace with the growth of the middle class and the resultant surge in car ownership. Lebaran is the time of year when Jakarta “exports” its notorious traffic jams to the rest of the island. Eventually, two hours after stopping at a traditional market for a much-needed toilet break, we pull over by a high-hatted farmhouse surrounded by golden fields of corn. This, I soon learn, is the ancestral home of Bama’s paternal great-grandfather. 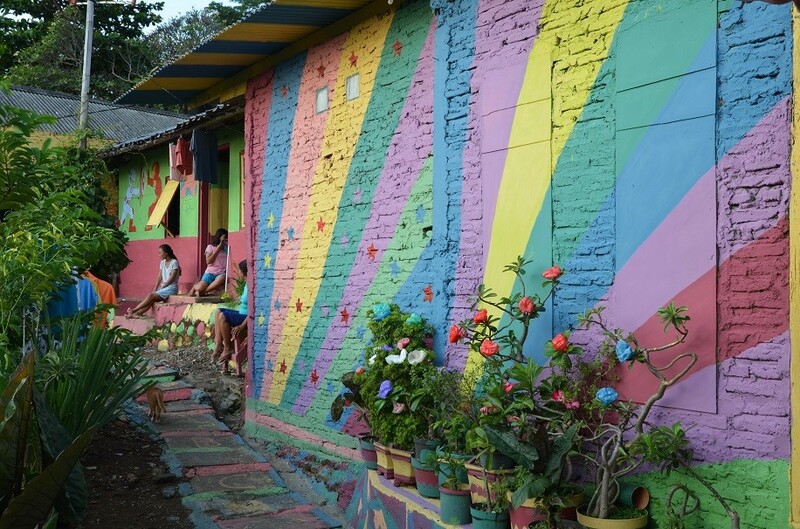 The terracotta-tiled roof spreads out over a porch demarcated by a row of slender columns painted in white, blue, lime-green, and bubblegum pink. I’m told the structure was renovated in 1925, which likely puts the original construction at more than a century old. Within the dark interior, carved wooden screens separate the living room from the airy hall for receiving guests, where we sit crosslegged on rattan mats behind bowls of boiled peanuts, bite-sized jellies in various fruit flavors, and fermented sticky rice wrapped in small parcels of banana leaf. Glasses of sweet tea have been thoughtfully scattered throughout the room, as have lidded jars stocked with deep-fried freshwater eel, cowskin crackers, and more savory nibbles. Mercifully, unlike that very first time I tagged along to the same family reunion, there are no plates of sliced watermelon for me to inadvertently step on. 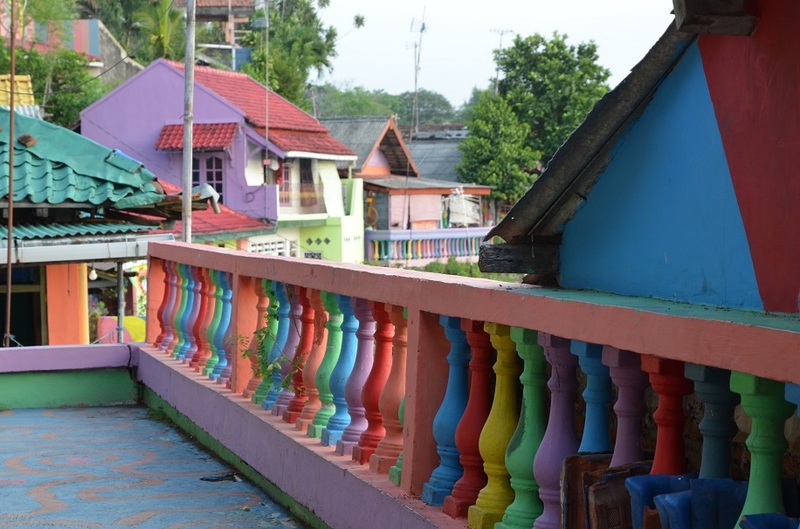 Late one afternoon, Bama and I head to the neighborhood now known as Kampung Pelangi, or “Rainbow Village”. 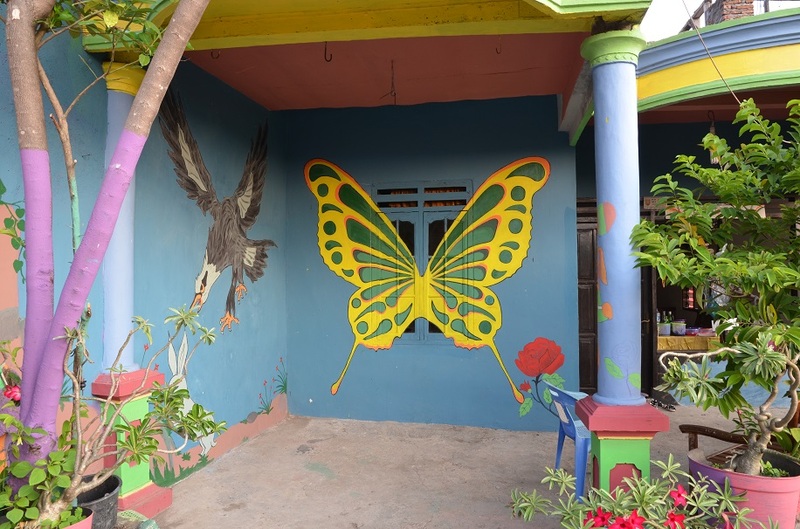 So the story goes, a schoolteacher had the brilliant idea of repainting all the houses in psychedelic colors and asking local artists to help out – adorning the walls and pathways with Javanese wayang characters, a giant butterfly, cartoon personalities known the world over, and more. 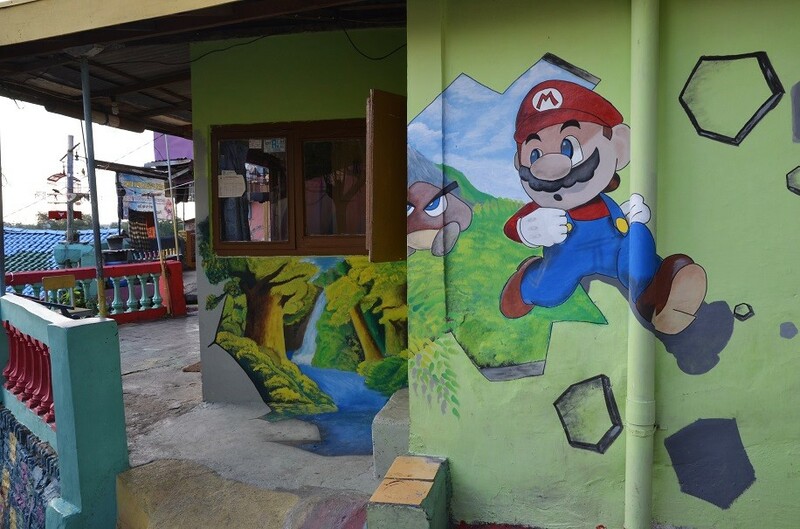 Apart from fostering a sense of communal pride, the project has turned the locale into an instant tourist attraction; even the websites of American travel publications got wind of the makeover. The warren of steep lanes and byways – meandering from a riverbank up to a hilltop cemetery – is now the unlikely backdrop for selfies, Instagram posts, and in the case of a young Indonesian singer, a music video. Bama and I join the curious wanderers who troop past smiling and bemused residents, fascinated by the sudden interest in their humble neighborhood, formerly the preserve of skilled motorcyclists (how on earth do they get up those incredibly steep pathways?) and well-fed house cats. 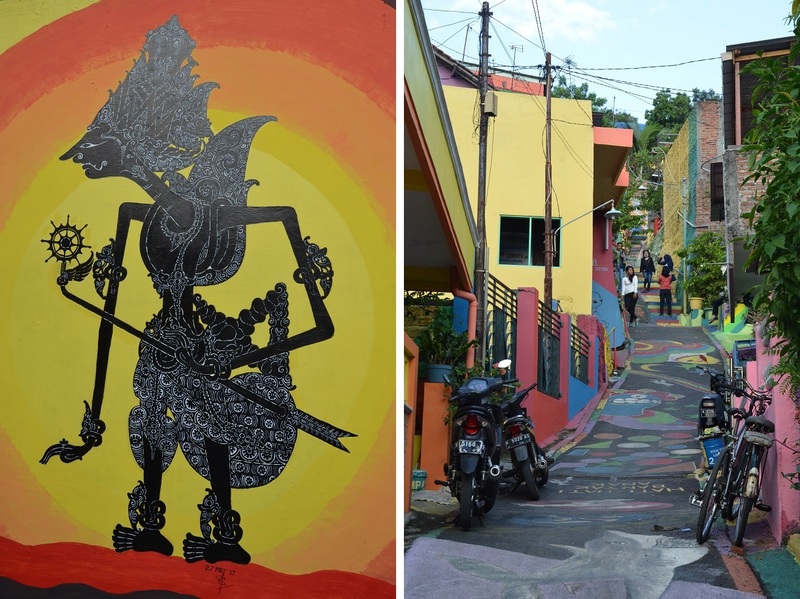 If anything, a visit to Kampung Pelangi – and Semarang as a whole – is a reminder that the idea of the unusual (or exotic) is a completely subjective one. “I’ve wanted to go to Pizza Hut for a long time,” Auntie Dhani says, as we drive past one of the city’s three branches. “I’d like to order different kinds of pizza and pasta to get a taste of each one.” Sadly, American-style fast food is too foreign for the palate of Bama’s father, Uncle Basuki, so she must wait for whenever Bama is in town to try out any unusual dishes. We end up treating her to the novelty of prawn bruschetta and a pizza crust stuffed with molten cheese. Auntie Dhani, in her own quiet way, is appreciative of her first taste of nachos, not to mention the fettucine with beef pastrami, mushroom, and diced onion in cream sauce. 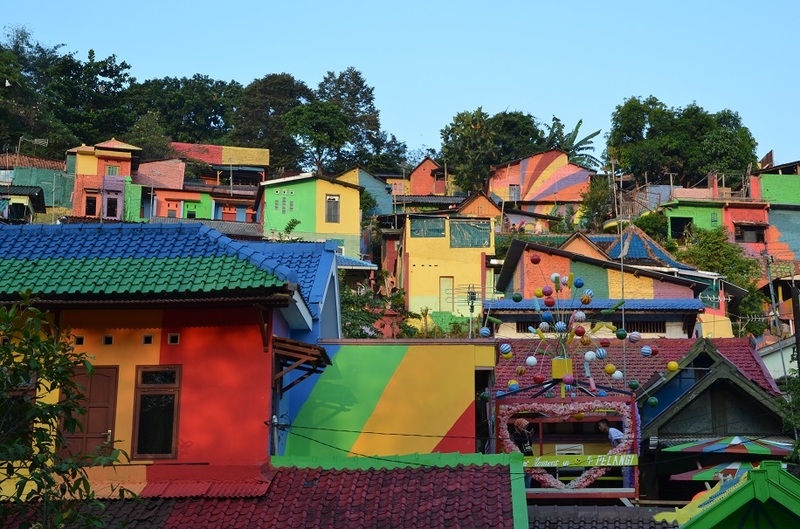 The entire story is great, and I love the Rainbow Village pictures. Thanks! 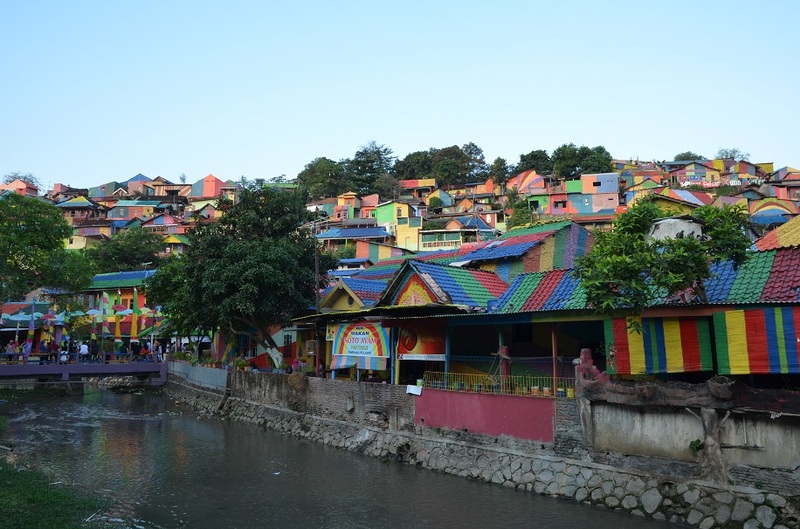 The Rainbow Village was really eye-catching – I won’t be surprised if an enterprising local decides to open a guesthouse somewhere down the line. Funny you mention that – I had a feeling the neighborhood was close to Lawang Sewu, which it was. 🙂 Fingers crossed I’ll be back in Semarang for Lebaran next year… my parents may want to see me in Hong Kong if I can find reasonably priced return tickets! What a lovely Id lunch. 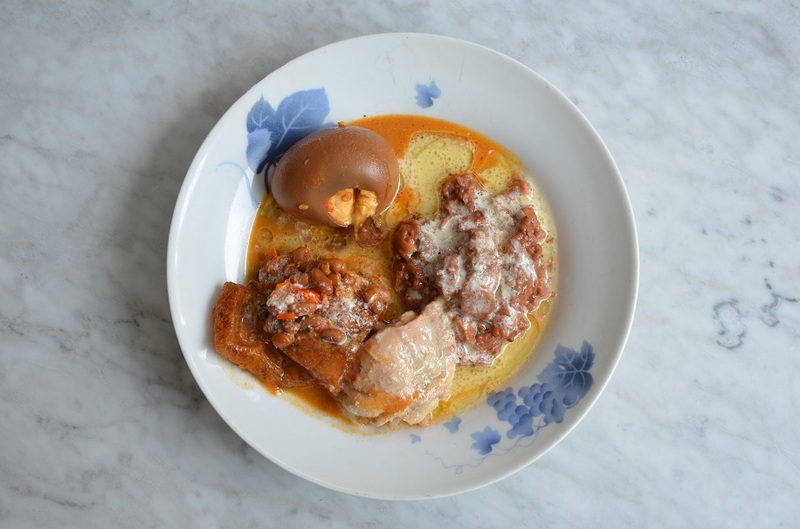 I love that photo of gudeg; I can almost taste it although I’ve never eaten it. 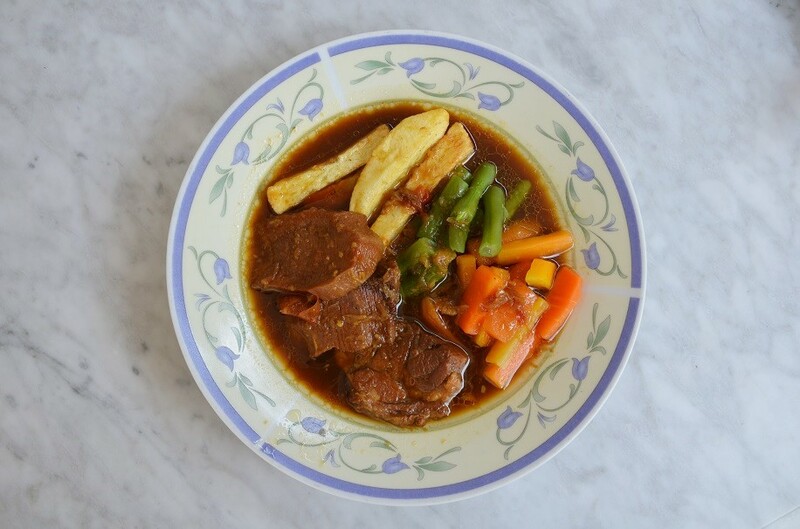 Gudeg is one of my favorite Indonesian dishes… it will suit you especially well if you have a sweet tooth! This post was pure fun! The pretty cats, the painted houses, the title box of sweets, and Bama’s adorable mom were confections in themselves, especially at the end of that arduous drive. The coup de grace was the Pizza Hut story; i actually laughed out loud when you said the food there was too foreign for Bama’s father’s palate – right after you had listed dishes like duck eggs, dried beef skin, deep-fried freshwater eel, and cowskin crackers! Our tastes certainly are subjective, and I loved reading what delicacies Auntie Dhani had at good old Pizza Hut! It was so good to read about your reaction, Lex – I have to admit that Pizza Hut is one of my guilty pleasures even here in Indonesia! At one point I got around to explaining guacamole and pesto (with the help of Bama’s translation skills) to Auntie Dhani, and she was very intrigued by these sauces she’d never tried before. Thank you, Carissa!! It’s only the first day back at the office and I’m definitely feeling the post-holiday blues. Any chance of more big projects here in Indonesia? What a special time you had with Bama’s family! 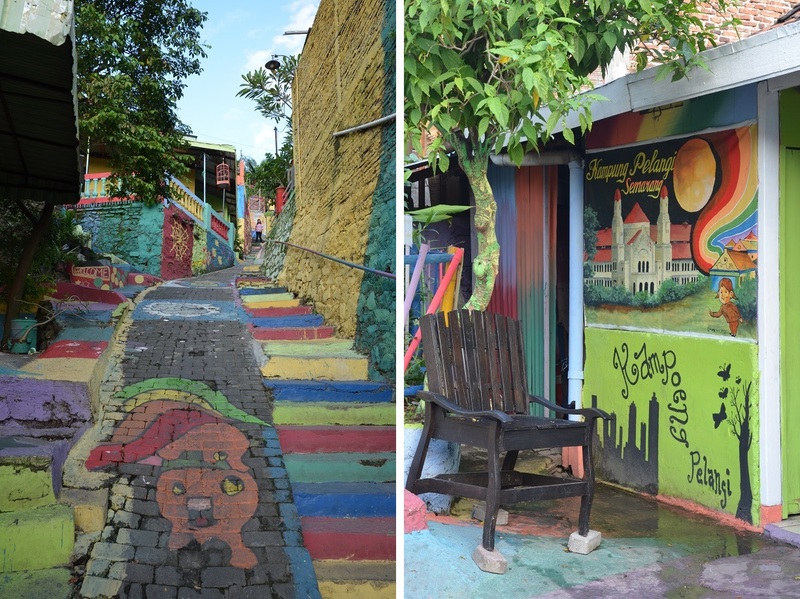 I can see why people like to visit the wonderfully colorful neighborhood – it would make anyone smile. 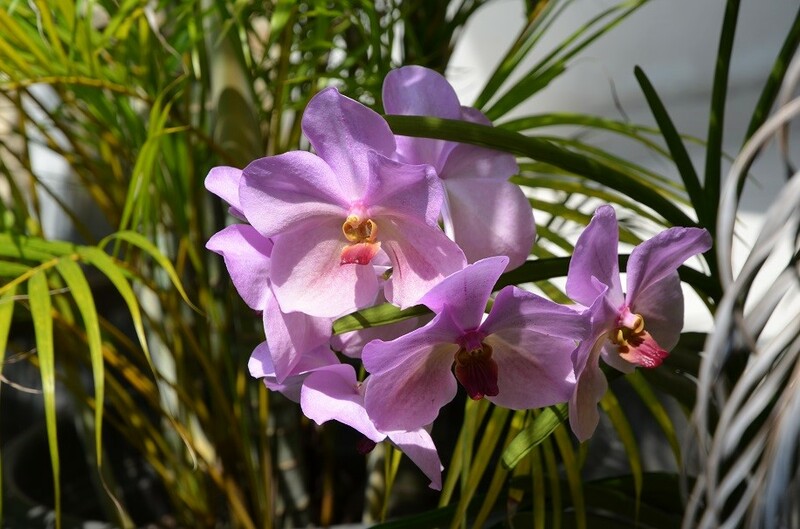 Absolutely – I felt so at home there and it was great to be spoiled by Auntie Dhani. I couldn’t leave without asking for a few more of her fabulous recipes! It would be interesting to find out what the local residents think – imagine waking up to that every single day! Posts like this are great. I get to see aspects of the world which I will never experience (I’ll never be able to get out to Asia). Thanks. Bama’s father isn’t missing anything by not eating American style fast food. You’re welcome, Ted. I have Bama and his family to thank for an inside look at how most Indonesians celebrate their biggest holiday of the year. As for fast food like Pizza Hut… there’s always a time and place for it, though I would never have it more than once every few weeks!